The latest doozy comes to us from the Regional Transportation Commission (RTC) in Clark County, which apparently has $50 million samolians to burn. But then again, it’s only taxpayer money, right? Ever since the government ran out of town the valley’s privately owned and operated bus system in the 90s, the new CAT system has been managed and operated by a company named Veolia – which I believe is French for “take it in the shorts taxpayer.” But I could be wrong about that. In any event, after all these years of monopoly operation of the local transit system, and in light of the devastating economic collapse here, the RTC last year officially requested proposals from other operators to see if maybe it couldn’t get more bang for the taxpayer’s buck. First Transit has been providing bus services in over 200 communities all over the U.S. for over 50 years now, including operation of the national Greyhound Bus system. So it’s not like they just fell off the turnip truck. And the company submitted a bid to take over operations of our CAT system from Veolia which does exactly what the RTC said it wanted done: Provide the same service for less. In this case, $50 million less! That’s not chickenfeed, even if it is *only* taxpayer dollars. How do they propose pulling this off? Well, there’s some guaranteed fuel-savings included in the proposal, as well as other changes designed to boost fare-paying ridership, and some savings derived from the company’s international buying power for parts, lubricants, etc. But the real savings would come from the company’s conscious decision – with an empathetic eye on southern Nevada’s crippled economy – to simply accept a smaller profit than fat-and-happy Veolia was willing to take in its own proposal. Bear in mind, we’re not talking about the company bringing in all new buses here. No, all we’re talking about is a management change. 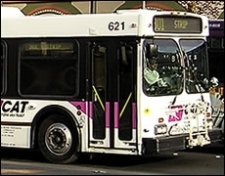 In addition, First Transit said that not only would it keep the current employees onboard and negotiate with their existing collective bargaining union, it would give them a raise and offer a comparable benefits package. But can First Transit pull it off? Can they deliver the steak and not just the sizzle? Well, according to Applied Analysis, a highly-respected, independent financial consultant hired by the RTC to review and evaluate the First Transit proposal….yes. As such, the eight-member RTC voted 4-3 in May (Lois Tarkanian was absent) to award the CAT system management contract to the lowest, super-highly-qualified bidder. But Veolia isn’t riding off into that good night without a fight. It challenged the May vote and won a decision on a technicality. Contract approval requires 5 votes, not simply a majority of those present. So a new vote is scheduled for August 11….and Mrs. Tarkanian is the swing vote. If she votes to keep the more expensive Veolia, the whole thing ends up in an expensive, drawn-out lawsuit which taxpayers will have to fund in addition to paying $50 million more to operate our transit system over the next few years. But if she affirms the RTC’s May vote – and in the process fulfills the RTC’s stated objective in asking for competitive bids last year in the first place – taxpayers, transit employees and bus riders will all win a huge victory. Is government REALLY cut to the bone without a dime to spare? Of course not. And we just might see rock-solid, indisputable proof of that on August 11. Or the RTC could do the right thing and show a little loyalty to us taxpayers. I put the odds at no better than 50-50.